China and Hong Kong have huge food and services industry, which lifts the application of equipment across multiple food service outlets. There are growing consumers for dine-in or online deliveries, pushing for the use of advance equipment for timely execution of the orders. Compared to 2015 statistics, the number of food service outlets and restaurants has grown by 3 % in Hong Kong and 6.1% in China. These factors over the period of time have been majorly driving the growth of the China and Hong Kong food service equipment market. Moreover, China food service industry acquired nearly 34% market share of the total Asia-Pacific food service industry in 2017. Whereas, Hong Kong has slow growing economy, yet the customers have high disposable income and at a fast rate they have shifted towards dining in the restaurants and online deliveries of the food. Thus, it led to growing food service industry in Hong Kong. Full service restaurants have the major share in the growth of food service industry, thus the growth of full service restaurants highlights the increasing opportunities for the application food service equipment. Further, the cooking equipment and the refrigerators are most common equipment used in any food service outlet, thus capturing the major market share. The food equipment manufacturing companies designs the products focused on their customer critical need and requirement and also provides services from delivery and installation to repair and maintenance services. Thus, it attracts more number of food service outlets/restaurants to deal with big market players. Goldstein Research analyst forecast that the China & Hong Kong food service equipment market is set to reach USD 20 billion by 2025, growing at a CAGR of 7.3% over the forecast period (2016-2025). Cooking Equipment accounted for largest market share of 33.4% in 2017 of China & Hong Kong food service equipment market. Cooking equipment is closely followed by the refrigerators and chillers market share and is expected to grow at a CAGR of 7.0% over the forecast period. Geographically, China accounted for largest market share of 73.1% in 2017 of China & Hong Kong food service equipment market, followed by Hong Kong, on the back of growing food service industry and the food service equipment manufacturers. The report covers the present ground scenario and the future growth prospects of the food service equipment market for 2016-2024 along with the market players’ analysis. We calculated the market size and revenue share on the basis of revenue generated from major players in the China & Hong Kong region. 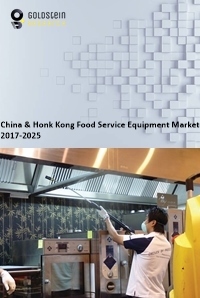 China & Hong Kong food service equipment market is forecasted on the basis of food service equipment production supply and agricultural produce. China & Hong Kong food service equipment Market Outlook 2016-2024, has been prepared based on an in-depth market analysis from industry experts. The report covers the competitive landscape and current position of major players in the China & Hong Kong food service equipment market space. The report also includes porter’s five force model, SWOT analysis, company profiling, business strategies of market players and their business models. “China & Hong Kong Food service equipment Market Report” also recognizes value chain analysis to understand the cost differentiation, pricing models to provide competitive advantage to the existing and new entry players. Our China & Hong Kong food service equipment market report comprises of the following companies as the key players: Illinois Tool Works Inc., Rational AG, Fujimak Corporation, AB Electrolux, Manitowac Company Inc., Hobart Corporation, Duke Manufacturing Co.Inc., Sia Huat, Town Food Service Equipment Co. Inc., New Asia FSE Inc.